We met in the Garden of Eden. From that moment on, my life was forever changed. We met in the Garden of Eden, and we fell in love under an apple tree. Every love story has a beginning, and this was our beginning. Our story begins with Adam and Eve. I'm not getting biblical here. Our story really DOES begin with Adam and Eve. 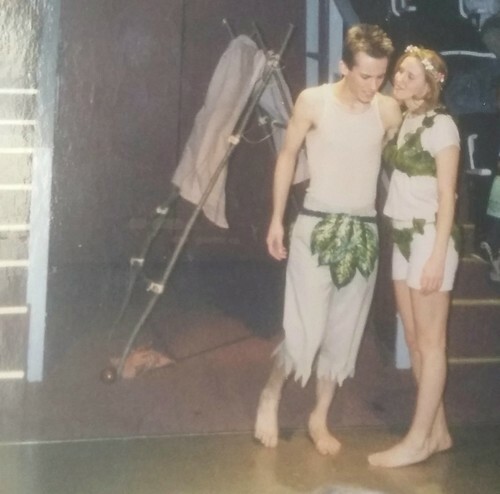 Grant and I met in a musical called "The Apple Tree." I was the Eve to his Adam! Not many couples can claim that they met when they were cast as Adam and Eve! It all began when my dad told me about auditions for an upcoming musical. He thought it would be a great idea for me to become involved in theater again after a short break. I really didn't want to audition at first, but on the day of the auditions, I felt compelled to go. I was very surprised when I found out I was cast as Eve, which was one of the female leads. During the first read-through, I sat near the stage. "Adam" was behind me. When I think back, I can't even remember our first meeting. I'm sure it was a handshake and a "I'm happy to be working with you!" He was just a cast member. I had NO idea that my "co-star" was going to become my husband! Over the course of the next few weeks, as we learned our lines and our songs and our blocking, we began to feel a spark. That spark grew and we were officially a couple by opening night! We fell more in love as the weeks passed by, and 5 months after we met, we got engaged. I know it sounds crazy. We were SO young. I was barely 18. But it felt so right. When Grant proposed, I didn't even hesitate. I didn't even think about what he was asking. I just immediately said yes. Grant and I knew we were meant to be together. We immediately began planning our wedding and planning for the future. A year and a half after we got engaged, Grant and I got married. Our wedding was absolutely perfect, but I will save that for another day. Grant and I stood in the front of a church crowded with our family and friends, and prepared to love each other forever. The room was completely silent for a few seconds. Then the Pastor spoke. "They met in the Garden of Eden and they fell in love under an apple tree." Over the course of 15 years, we created our story. It wasn't always perfect. There were many times when it would have just been easier to walk away. But for every challenge thrown our way, there was an incredible moment that followed. There's something truly special about "growing up" with your spouse. I have been with Grant for my ENTIRE adult life. I watched him change from a teenager to a young adult. I watched him become a father FOUR times. I watched him remain completely calm and stoic as we were told that our 4th child was far different from what we expected. I watched him grow into a responsible man who works hard for his family and loves his children with all his might. Life may not always be perfect, but I am so proud of how far we've come. I truly can't imagine life any other way. 15 years and 4 kids later, we made it. We stayed together, despite every hurdle along the way. My best friend is at my side and our story continues with our four amazing sidekicks! Linking up our love story with Our Pretty Little Girls for Tuesday Talk! You are such a beautiful couple! I love your story! What a blessing your family is...congrats on so many years of partnership! I only hope to have that one day! Thank you! Everyone is surprised when they hear how long we have been together! I LOVE this!!! So so fun and seriously, I don't know if anyone else could say they met their spouse when they were Adam and Eve together. Eric and I only dated for 5 months before we got engaged also, and then we got married 4 months later! 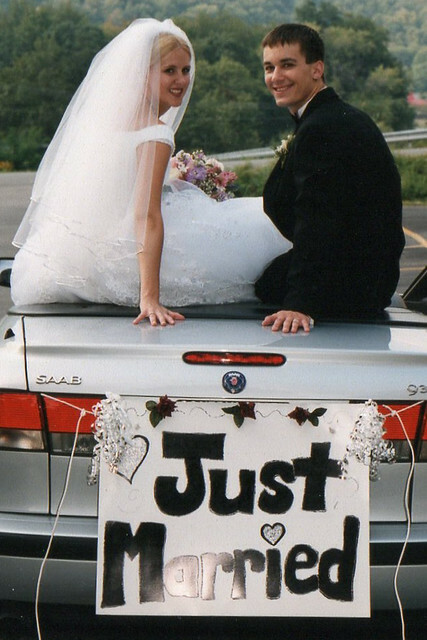 So yep only 9 months total, almost 15 years later and we couldn't be any happier. Sometimes when you know, you just know. Thank you for sharing this wonderful history of your sweet love and family. Thank you for sharing your history of your sweet love and family. I wasn't quite sure if I ever shared it on here before. I figured it was time! That is seriously the cutest story ever. Love it! What a wonderful story! I didn't realize you've been together for 15 years! I just LOVE your wedding photo--you both look so young and happy. It sounds like some people were just meant to be together, and that's obviously the case for you and Grant. May your marriage always be blessed. It has been a LONG time! We were so young. Thank you! Such a sweet love story! what a cool love story! 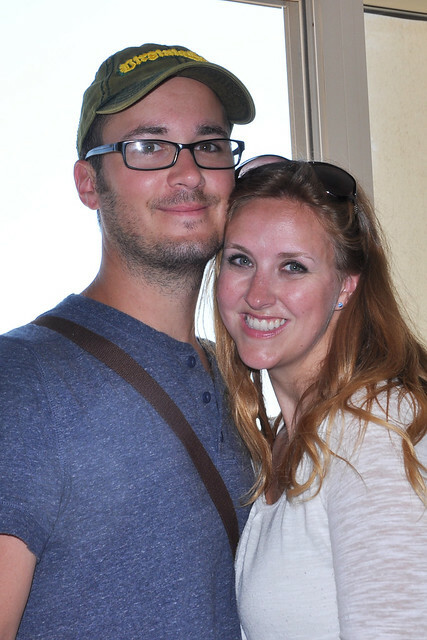 We also got engaged when I was 18, although we got married 5 months later. P.S. You don't age at all! Thank you, Miranda! Everyone always thinks my husband and I are much younger than we really are. I'm sure we'll appreciate that one day! Hello from Tuesday Talk linkup. I loved your story and so happy you joined myself and my co-hosts in sharing our stories this Valentine's week. My daughter was married very young too and in spite of our "worried thoughts" about being too young, I look back and know he was chosen for her at just the right time. They've been married 8 years now and have given me two grandchildren who are my joys in life. So it can be done! Like you, they waited five years before having children so they could get to really know one another and begin their life together. I'm so glad it worked out for your daughter! XOXO Thank you for stopping by! I love that you met through playing Adam & Eve! Very rare in deed! I love the throwback pictures too- those are my favorite! Wow! Great story! And it all started in the Garden of Eden...no apples included!!! God truly is good - through the blessings and the challenges! !